This clear Acrylic Toke (tip) Box with locking lid & Metal J Hook allows the dealer to see what's inside while protecting his tips. Toke boxes are a must for any casino table game. This box has a very high quality finish with thick clear acrylic and professionally polished rounded edges on all sides of the box. There is one set of two keys included for the security cam lock located at the top of the box next to the money drop slot. 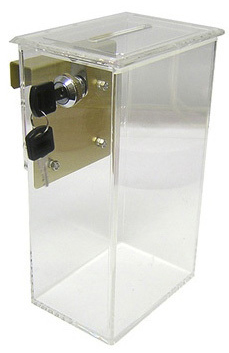 With the turn of the key, the sliding top is released, letting you retrieve the chips/money out from this acrylic toke box.